I have been pondering paint colors. My house was built in 1894, and we think of Victorian-era houses as being very dark. We assume this because we only have black/white images of the era. If color images existed I suspect we would be shocked at how colorful many Victorian-era homes actually were. We long assumed the same about Colonial-era houses. But recent discoveries have confirmed that those crazy Colonial kids also loved intense, rich colors. This is the dining room at the home of Thomas Jefferson, Monticello. 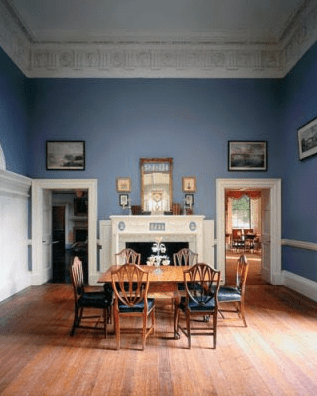 For a very long time the room was painted blue. A nice, safe, respectable color. Photo: Thomas Jefferson Foundation. 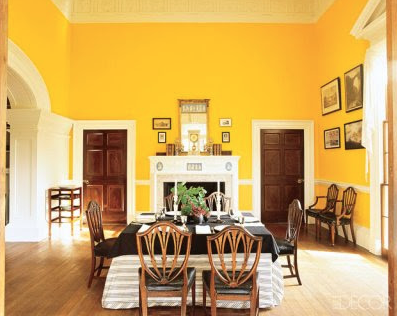 But recently, a historic paint analysis confirmed that in 1815 Jefferson painted the room in a eye-popping chrome yellow. Such a shade was cutting edge, having been commercially available for only three years. Photo: Elle Decor. At the Cross House, I am am hoping to paint two rooms next month: the living room and library. The library will, appropriately, be filled with shelves and books. So, you will not see much of the walls, although the ceiling will be prominent. I was thinking of Tiffany Blue, which will also complement the colors in the three stained-glass windows. I love bright colors when tastefully used. The Tiffany Blue is, yes, gorgeous. I don’t see a swatch for the chartreuse. Your wish, Grace, is my command! I have added a link to chartreuse. Ross just as you did with the roof shingles I believe there are apps out there that will allow you to play with the colors you want on the walls before you paint those large rooms. The roof app was kinda basic, as the exterior of the house is a finite thing. With interior paint apps, I will be dealing with a zillion things which cannot be uploaded into the app, like carpets, draperies, furnishing, pictures, etc. All will change how the room looks, and how the wall color displays. Once the rooms are painted, but still otherwise bare, they will look INTENSE! But as the furnishing get installed, the whole look will change. And the rooms will look different in the morning light, afternoon light, evening light, and at night! Love the blue. It will be beautiful in that space. Well you absolutely CANNOT go wrong with Tiffany BLUE!! The yellow is fantastic. I painted my home office this colour. A good way to start the day! I’m thinking possibly Tiffany blue for my back bedroom, too. I’m second guessing the gallon I just bought… Tiffany blue would probably be cheery in the morning sun, right? What color is the gallon? Oh, hmm. That was poorly edited. I bought this. And there was no second gallon yet. There probably will be and possibly not in the same color. Anyways, I’m about to publish a post on the painting that happened. Hey Ross, just a suggestion, find the rug and or curtains first and then match the paint to them. Its kind of a chicken and egg thing, but much easier imho. (I’ve designed some interiors and do custom art pieces so I deal a lot with paint) I love the ideas of the colors! Very fun. Love the Tiffany blue. It’ll make the woodwork pop! For me, what you’re calling Chartreuse I would put squarely in the yellow range. The background of the GoFundMe button is closer to what I think of as Chartreuse. Looking at the Sherwin Williams site, Electric Lime (SW 6921) and Center Stage (SW 6920) fall in my Chartreuse range. I’m in love with Gold Crest (SW 6670) and Invigorate (SW 6886). Both are mouthwateringly gorgeous. Chartreuse is a combination of yellow and green. There are many many many variations of Chartreuse! This is kind of a late comment, but I have two things to add about paint colors. First, it is much easier to match paint to a fabric, rather than vice versa. So do look at your window coverings, rugs, and large furniture first, then match the paint color to them. Secondly, be sure that colors of different rooms have a good flow. When I bought my house, the living room was maroon, the kitchen was olive green with a florescent yellow ceiling, and the dining room was dark green and ORANGE. It was really nauseating since all three rooms were visible from each other. What I did is to pick three colors, and play with various tints of the colors in the rooms. My colors were maroon, teal, and pale lemon yellow. So the maroon living room flows in to a kitchen that has white cabinets and a teal island with the little bit of wall pink (maroon with white). The dining room now has white wainscoting with a much lighter teal above it (since it faces north and is very dark). The front hall is the pale yellow, but backgrounds of paintings in the living room are the same color, as well as some of the furniture and fabrics. In rooms that the doors are usually kept shut, like bedrooms, this is not such an issue. Wherein Williams has obviously rearranged their site since Ross first wrote this. The link does go to S-W, type chartreuse into the search field. It is not what I thought it was, at all. Go take a look! I think because the exterior is olive green, this chartreuse will resonate inside but be much brighter. I predict that when the room is finished, it will first appear as plain yellow to someone entering the room and the green component will be noticed later.